The document “Toxic, Corrosive and Hazardous: The government’s record on health and safety”, says that in the last four years the government has cut Health and Safety Executive (HSE) inspections and reduced its funding by about 40%. The government has blocked new regulations and removed existing protections and prevented improved European regulation on health and safety. Support for employers and health and safety representatives has been cut. The report says that far more people die as a result of a disease that they get from work than are killed in an ‘accident’. They are also far more likely to be made ill than injured. More than 70% of sickness absence caused by work is due to either stress or musculoskeletal disorders, such as back pain or RSI. ‘This report comprehensively shows the actions of a callous government that is vastly reducing the HSE’s abilities to bring rogue employers to account’, said Ms Steele. Frances O’Grady, the TUC general secretary, said: ‘The government says that the UK is a safe place to work and that we don’t need any more regulation. If only this were the case. With the UK ranked just 20th in the health and safety risk index of 34 developed nations, we’ve hardly got a record to be proud of’. 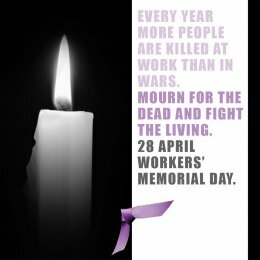 The report was published to coincide with Workers’ Memorial Day, held on 28 April every year. A CSP advice sheet for members on safety at work is available on the society’s website. It outlines the role of health and safety reps and encourages members to speak with their reps about their concerns.